After more than two weeks on the road, Adam and I spent our last night on our Quark Expeditions cruise drinking wine and eating lobster tail, packing our suitcases, and gazing out the window as the last of the Drake Passage’s waves lapped at the ship. We had done it: we visited our seventh continent. 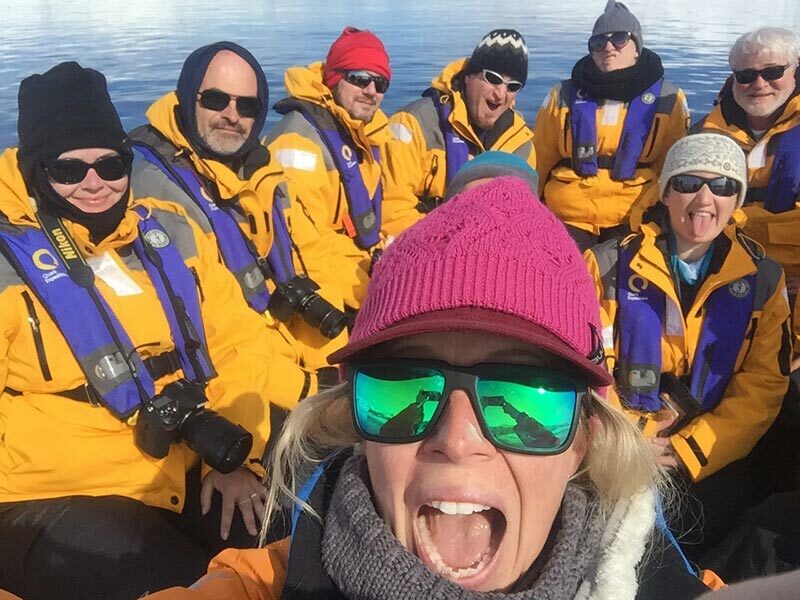 We admired penguins, listened to glaciers calving while we fell asleep on the ice of Antarctica, and I had jumped into the freezing Southern Ocean. Before that we had explored Buenos Aires and Montevideo, two cities we thoroughly enjoyed. When our alarm went off at 5:45 on the morning of our departure I felt accomplished and ready to go home. Our trip was perfect, and it was time to head back to DC to celebrate the holidays and the journey we had taken. Adam took a shower while I started a final check of our cabin, unplugging our phones and scooping up a single piece of paper that had been slipped under our door. I glanced at it quickly, expecting it to be a receipt for the cappuccino Adam ordered after breakfast the day before, but the paper had too many words for it to be a bill. I switched on a light to read what it said. “No,” I said. “No, no, NO!” I stood in my pajamas, listening to the water in the shower and the sounds of muffled conversations in the hallway. Eventually, the water stopped, and a few moments later Adam emerged from the bathroom. “Ready to go home?” Adam asked with a smile. I shook my head. “We’re not going home,” I said. Adam’s smile faded. I handed him the paper. That was the moment our journey changed from a standard flight home to our Escape from Fin del Mundo and the End of the World. Stranded in the southernmost city in the world?! We have written quite a bit about the importance of flexibility and why you need to be as educated about your trip and your options as possible. Sometimes, though, you might face a perfect storm of challenges for which there is no way to prepare and no reasonable alternatives to alleviate the situation. In short, sometimes you just get stuck. That’s what happened to us: we got stuck in Ushuaia, Argentina on our way home, and it ended up being one of the most frustrating, worrisome, and—believe it or not—fun experiences we have ever had on the road. 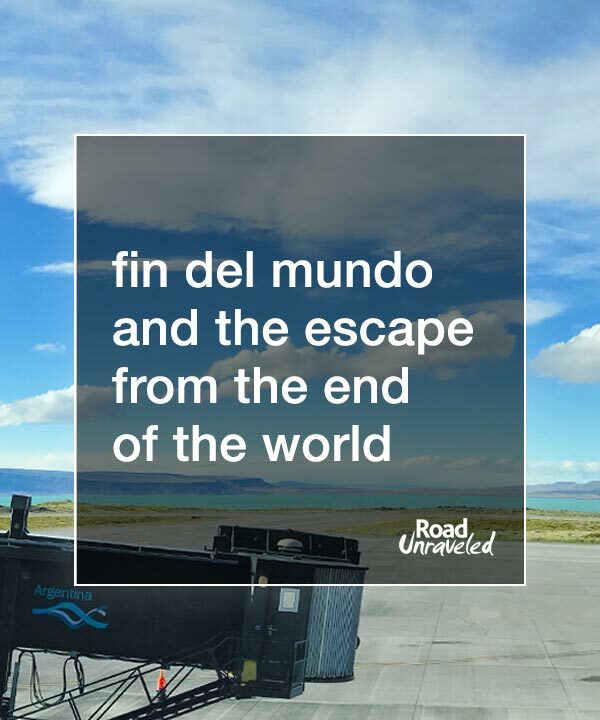 Here’s the story of how we found ourselves stranded in the southernmost city in the world and a few lessons we learned as we escaped from Fin Del Mundo and the end of the world. Little did we know that, while we dined on lobster and enjoyed cocktails and conversation with our friends on the ship, a major political crisis was unraveling in Buenos Aires. Argentina’s government was set to vote on a new calculation for how pensions are paid, and the Confederación General del Trabajo de la República Argentina, the primary labor union, decided to call a 24-hour strike to protest the changes. That meant as of 12:00 PM on Monday, December 18, 2017, all airline workers would walk off the job, cancelling hundreds of flights and stranding thousands of passengers. 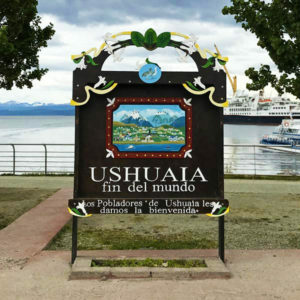 Our cruise returned to Ushuaia at 8:00 AM on December 18, and Adam and I were booked on a 1:30 PM flight to Buenos Aires—just ninety minutes too late. In this case, there wasn’t anything we could have done to prevent the situation we now faced. 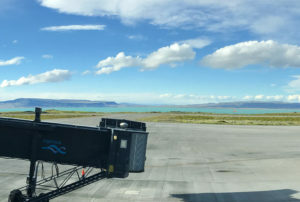 We booked an early afternoon flight on Quark’s recommendation; if we were delayed getting into Ushuaia or by customs we could easily have missed a morning flight, and that has happened to plenty of people in the past. We certainly have no control over labor disputes and airline operations. Unlike our trip to Louisville, when our flight was cancelled because of mechanical issues, there were no alternative flights to consider: there were no flights at all. No amount of preparation or planning could have kept us from getting stuck that day, and stuck we were. Of the 180 passengers on our boat, more than 90% of them were scheduled to depart after the strike went into effect, which meant when we opened our door at 6:30 AM widespread panic had replaced the general jubilation that surrounded the ship just hours earlier. I glanced around the hallway and shut the door to our room; it was time to do some research. Many of the friends we made on the cruise were also stranded with us. I activated my international data plan (my carrier offers one for $10/day) and scanned through my emails. Sure enough, the most recent messages were from Aerolineas Argentinas, letting me know my flights were cancelled due to the planned disruption. There was no information on rebooking, though, so I called Priceline—the website we used to book our flights months earlier—to see what could be done. The representative I spoke with was very cheerful at first, but it wasn’t long before she had some bad news for us: the earliest she could get us out of Ushuaia would be Wednesday, two days later, and it would take a full 48 hours, five flights, and two lengthy layovers to travel between the Ushuaia and Washington, DC. Our original itinerary had us in transit for a full 24 hours, but the thought of spending 48 hours bouncing between airports was unimaginable. “You must be kidding,” I said to her. “You’re telling me there is no way you can get us out tomorrow afternoon? We have to get back to work!” The woman on the phone sounded apologetic as she said that was the best she could do—and if we didn’t confirm that itinerary, she might not be able to get us home until after Christmas. I rolled my eyes. “Confirm us for these flights, but this isn’t acceptable,” I told her. “We’ll just go to the airport and have the airline put us on a better combination of flights.” I stayed with her on the phone until my new, confirmed itinerary arrived in my inbox, at which point Adam and I joined the crowds in the ship’s reception area. Reception looked more like a strategy planning session than a departure point for happy travelers. People with active data plans were searching the internet for bus routes, flight schedules, and car rentals. People without data plans were grouping together, asking for advice and preparing their next move. I quickly learned that there was a bus to Buenos Aires, but it would take 36 hours and might be sold out since it was close to Christmas. Renting a car seemed expensive but remained an option. Several of us discussed finding a charter bus to rent for as many people as we could accommodate, but that was quickly dismissed since the drivers would likely be part of the labor strike. As most people accepted their fate and started looking for hotels in Ushuaia, Adam and I decided to join a few other people and take a shuttle bus to the airport. I figured at worst we would be able to confirm our new itinerary, and at best we could try to fly standby for one of the morning flights leaving before the strike. 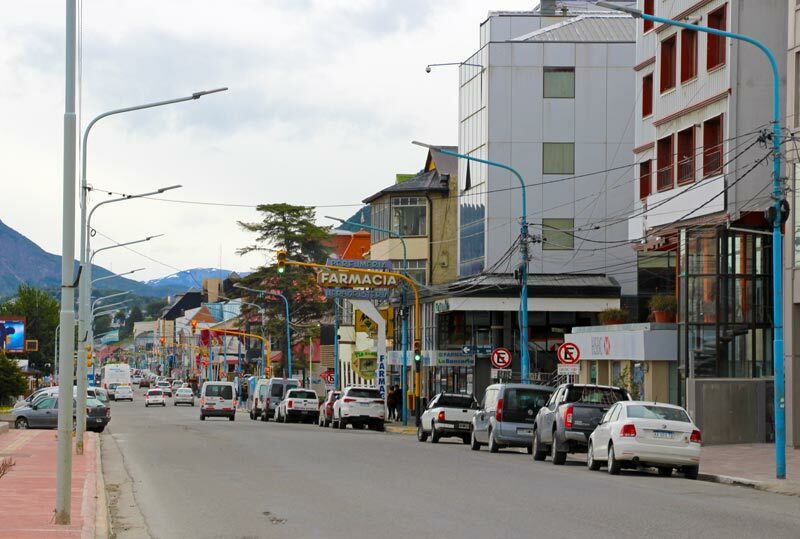 We had extra time to roam the streets of Ushuaia. We arrived at the airport to find a standby line that extended through the airport with hundreds of people impatiently waiting in front of us. Adam and I stood with fellow Antarctica cruise passengers Sarah and Kim, all four of us unamused by the crowds. Ahead of us, beyond our line of vision, a group of people started yelling. I assumed they had just learned they weren’t getting seats on the last flight of the day, which meant we definitely weren’t going home. The line slowly winded toward customer service, and we wheeled our suitcases along as the clock ticked ahead to the start of the strike. Just before noon our turn in line arrived, and an exhausted man slumped over a computer screen as he looked up our confirmation. We were in the system for Wednesday morning, he said, just as the woman from Priceline had told us. I asked if he could put us on standby for the next day. He snickered. “There won’t be flights tomorrow,” he told me. “But come back here at 7:00 AM just in case.” I perked up; that sounded promising! Kim and Sarah received the same message, and we all joined a growing group of stranded Quark passengers in the Ushuaia airport’s tiny food court until we were the only people left, watching as the Aerolineas Argentinas employees gathered their belongings and left us without anywhere to go. Eventually, we shared a cab and left for our respective hotels. Our first day stranded in Ushuaia really wasn’t bad. We left our suitcases in our hotel and wandered around the streets, encountering fellow Antarctica cruisers in familiar yellow Quark parkas on almost every corner. It felt like a bizarre, unexpected family reunion; people we hadn’t talked with in days—or at all—greeted us with warm smiles, and we shared our hopes for upcoming travel home and progress we had made securing new transportation. 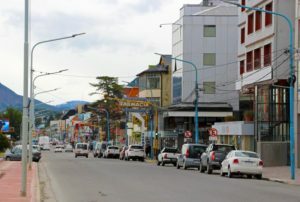 We learned about options for hiring drivers to take us across the border to Chile, where we could fly from Punta Arenas to Santiago and home from there, bypassing the strikes entirely. We ruled out renting a car, as that would be both expensive and complicated without an international driver’s license. We had a great, relaxing dinner with Kim, Sarah, and friends from the boat Bret, Heather, and her dad at a pizza place, laughing and feasting on tasty pizza and what we assumed would be our last empanadas of our trip. I felt optimistic about our travel plans for the next day: it seemed possible we might be going home! 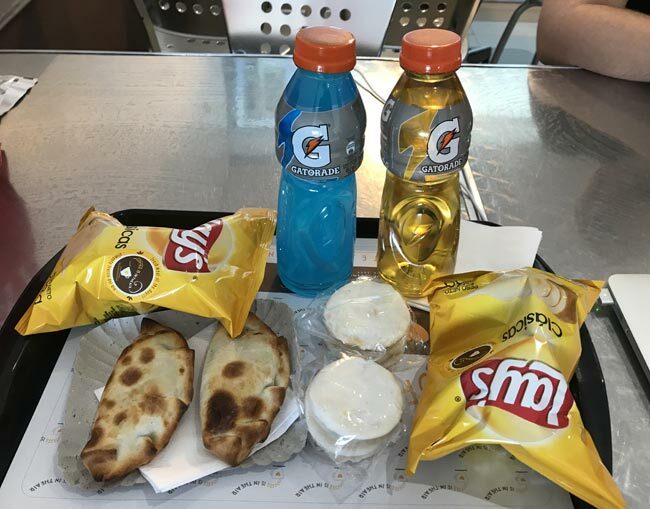 By 6 AM the next morning, Adam, Kim, Sarah, Bret and I—surrounded by boxes of leftover pizza from the night before—were settled into our spot at the front of the Aeorlineas Argentinas line at the airport. By mid-morning a few airport workers had arrived (good news, as the strike was scheduled to end at noon! ), but it wasn’t long after that they shared the bad news: if you didn’t have a confirmed seat on one of three flights that day, you weren’t leaving. Through my limited Spanish and the airline representative’s limited English, I learned that there would be only three flights that day: although others were scheduled, they would be cancelled. There would be no standby list. If you had a confirmed reservation for another day, as we did, you should return for that flight. If you had not been given another flight, you should return the following week—after Christmas—to make a new reservation. I gasped—that would mean some people would be stranded for more than a week in Ushuaia! 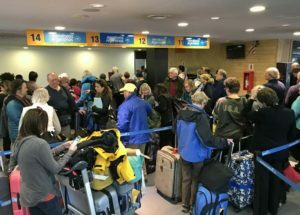 Kim, Sarah, and Bret were dismayed: they did not have new flights, which meant they were part of the untold hundreds of people who could be spending the holidays in el fin del mundo. Kim and Sarah quickly went to work securing a driver to take them to Chile, where they could get home without a week of waiting in Ushuaia. Adam and I booked a room at the same hotel Bret selected in downtown Ushuaia, and we shared a taxi to return to town for the second time in as many days. As our taxi escorted us to yet another hotel, I mentioned that we had an email confirming our new flights and asked Bret if he received anything similar. He hadn’t. I asked him if he had checked the website using his confirmation number, and he hadn’t had a chance to do that. I offered to let him use my computer at the hotel to check, despite the fact the airline staff at the airport hadn’t provided him with any information that would suggest he was rebooked. When we settled into the hotel lobby, I typed his six-digit confirmation code into their website and raised my eyebrows when it displayed a new itinerary—for the next day. Waiting for airplanes that might never come. At least we had a great view. “Bret, did you know you are scheduled to leave for Buenos Aires tomorrow?” Bret’s eyes grew wide, and he turned the laptop so he could read the information on the screen. “I can’t believe this!” he said, joy returning to his face as he realized he might make it home for the holidays. I took a screen shot of his itinerary and emailed it to him in case he needed it as proof of his confirmed reservation, and then we tackled a second challenge (rebooking his flight from a separate itinerary from Buenos Aires back to his home in the United States, which involved arguing with two different customer service representatives and reading their own rebooking policy from their website to avoid an expensive change fee). By the time we stood up again Bret had tickets home, and Adam and I were thrilled that we wouldn’t be leaving our new friend behind for a lonely Christmas in Ushuaia when we departed the next day. By now our small community felt like family, and we were all invested in each other’s success. Our second and final day in Ushuaia was a busy one as we met up with friends for drinks, ate more empanadas, exchanged travel plans, and watched the news for any sign that the strike might extend into another day. When we awoke the next morning and returned to the airport for a final time it really did feel like the end of our time there; finally, our escape from Fin Del Mundo was beginning! Adam and I arrived at the airport early—really early—in case there were big crowds, and sure enough there were already a hundred people crowded around the check in counter when we got there. Most people were trying to fly standby for an early flight to Buenos Aires, but we were committed to sticking to our undesirable but confirmed 48-hour itinerary that started with a 10-hour layover in El Calafate, a tiny town we had never heard of before that day. We didn’t want to risk getting stranded again by altering our plans; we just wanted to go home. As we stood in line, a small but growing protest broke out next to us, as several dozen people started chanting and yelling at the airport workers. Several of them got close to us, yelling something in Spanish at us that I loosely translated to understand they wanted us to give them our tickets. Adam and I locked eyes with the person next to us, Callum, who we recognized from the cruise. “I’m never traveling again,” Callum muttered. We eventually made it to the front of the line and checked in for the flight, and the three of us were beyond relieved when we made it through security and into the boarding area. Below us, by the ticket counters, another riot exploded, and more screaming echoed through the airport. Anxiety rippled through me, and I kept checking outside to see if our plane had arrived. We were called to board 20 minutes late, and I didn’t start to relax until we soared above Ushuaia. It felt surreal to see the city below us. We were finally escaping Fin Del Mundo and going home! Less than an hour later we touched down in El Calafate to start a ten-hour layover. Lengthy layovers are never ideal, but I was looking forward to potentially exploring the town or settling into a coffee shop to connect to wifi and get some work done. After getting off the plane we discovered a taxi into town would be rather expensive, and a ride to the main attraction—a glacier—would be even pricier, so we decided to stay put for the day. Ordinarily we would have made the most of the free time we had, but we didn’t want to risk facing any scenario that would prevent us from getting to Buenos Aires. It was better to wait close to the gate. Adam, Callum, and I found a table at the only restaurant in the airport, where we were joined by fellow cruisers Rob and his grandmother Margaret. With our phones out and laptops powered on, we simultaneously discovered our nightmare was getting worse: there was no internet at the airport. El Calafate looked awesome, but we didn’t want to risk missing our flights so we opted to stay at the airport. This was the point in our journey when I started to realize just how horrible the last few days had been. Our flights home were cancelled. We were stranded in Ushuaia for two days. Adam had to take several vacation days he didn’t intend to need, and I missed a variety of important client engagements for several new projects. I had been wearing the same outfit for three days, and Adam and I were both dangerously close to running out of clean underwear. With ten hours left before our next—but not final—flight, we had no internet to keep us entertained. 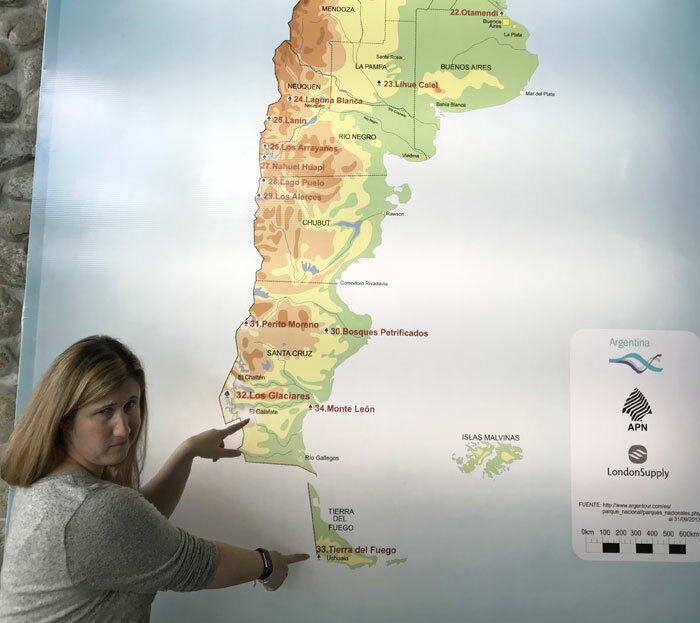 Worst of all, when looking at a map of Argentina I discovered we had barely left Ushuaia—El Calafate is only 500 miles from our starting point, and the lack of progress on our journey home weighed heavily on me as I slumped over my useless computer. We did the only thing left to do, which was to purchase yet another order of empanadas and entertain ourselves with stories and people watching until it was finally time to leave for Buenos Aires. The final part of our escape from Fin Del Mundo had less drama but just as much frustration as the beginning of our journey. Our morning was peaceful, and we had a great breakfast at our hotel with Callum and his friend before leaving for the airport, where we had an unnecessarily hard time identifying where we could check in for our flight due more to Aerolineas Argentinas’ disorganization than the crowds. After finally checking in, we discovered our flight was delayed by more than two hours, which meant we were in danger of missing our connection in Santiago which would take us to Atlanta—and again, Aerolineas Argentinas provided no information about why we were delayed and didn’t have a single gate agent available for questions in the boarding area. We finally arrived in Santiago less than an hour before our next flight took off, which meant we had to sprint through the airport to our gate to collect our boarding passes. We were the last ones to check in, so we ended up sitting in the second to last row on the plane for what was a long, uncomfortable flight. Landing in Atlanta was a highlight, but a few hours later when our very last flight touched down in Washington, DC we were all smiles: it took 96 hours, but we had escaped from Fin Del Mundo. We were exhausted, in desperate need of showers and clean clothes, and beyond tired of empanadas. But we were home. 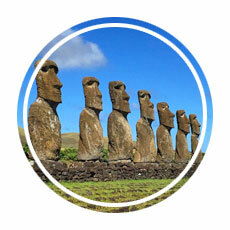 Until now, our go-to travel horror story was the same tale that started Road Unraveled in 2015: our luggage fiasco on the way to Easter Island. This adventure quickly surpassed it, and now that it is safely in our memories it’s a fun one to share because it’s just as much a story of triumph and friendship as it is frustration and delays. It was also an educational experience for us, and we learned a few great lessons along the way. 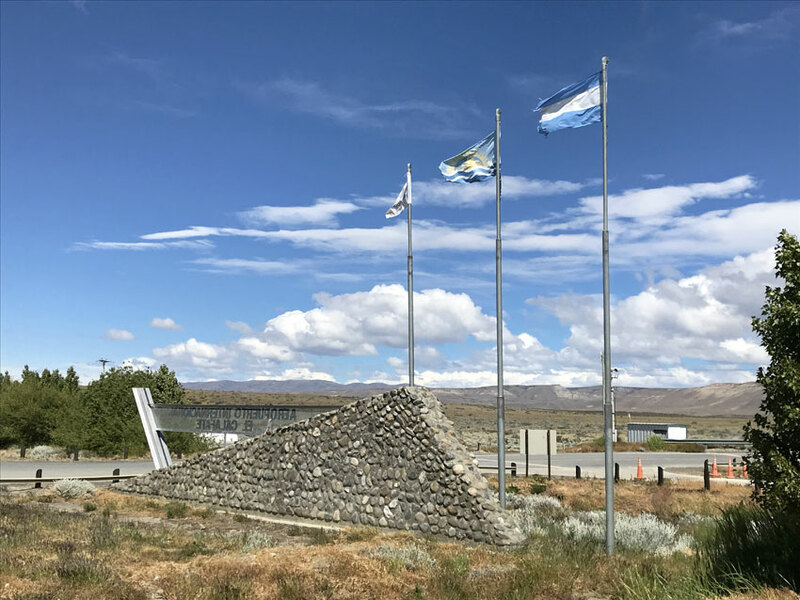 Stuck in El Calafate, but at least we were making progress. We were not happy with the flights we were offered, but we confirmed the itinerary presented to us in case nothing else came along. As it turned out nothing else did come along—we faced epically long standby lists and flights already full of holiday travelers. We were not in a position to be picky! If you are stranded and are offered a new itinerary, take the best option available, but be sure to confirm something—even if it doesn’t sound acceptable. It may be your best—or only—option. I knew my domestic carrier would let me access my cellular and data plans for just 10 USD a day while I was away from the United States, which meant it wasn’t very expensive for me to check my email and make an important call to Priceline when I first found out our flights were cancelled. That phone call most likely made the difference between getting home that week and getting stuck for more than a week: we had the Priceline customer service representative on our side to look up flights, which meant we had an itinerary (albeit a less-than-ideal one) before most people knew their flights were cancelled, too. If you can arrange for an international cell or data plan to access in an emergency you may open your options up considerably if you find yourself stranded and in need of a way to research your options. Aerolineas Argentinas rebooked a lot of people without notifying them, which is why many of our friends like Bret had no idea they had confirmed flights—and many of them may have missed those flights since they weren’t told about them. If your airline does not give you information or you want to confirm what they told you, be sure to use your confirmation number and regularly check your status. You may find information changes as flight schedules are moved, and in some cases you may find your situation is more promising than you thought it was! Travel isn’t just about getting yourself to and from your destination; it is about the people you encounter along the way. Adam and I were not happy when our plans were derailed by the strike, but our situation was made much more enjoyable because of the community we were part of during our travels. We learned about alternative transportation options and where to stay and eat while we were stuck in a few different cities along the route home. Ask for help when you need it and give help wherever you can. You never know if you can help save someone’s trip or if they can do the same for you. And stay in touch with your travel companions when the road splits your group apart; we followed the journeys of friends who took planes, trains, and automobiles from Ushuaia to all over the USA, Australia, Europe, South America, and Africa. Every time we heard someone made it home caused a new celebration, and we knew we had a lot of friends cheering for us when it was our turn to report we were safe and sound in our house. We spent more time laughing than we expected to during our escape from Fin Del Mundo. It was a crazy adventure that we got to share with a wonderful group of people (even if none of us would have preferred to be there!). Just because we weren’t happy about the strike didn’t mean we had to be miserable, and once we accepted our reality we had a lot of fun sharing meals, drinks, and shopping trips with friends. We ended up with some unexpectedly great experiences and wonderful memories. If you’re wondering how we afforded the surprise hotel, meal, and transportation expenses that come with being stranded somewhere for a few days, our travel insurance covered it all—which is why you should always purchase insurance before you travel! We purchased a policy for our entire trip from World Nomads. We were required to pay for our expenses upfront, but we filed a claim when we returned home and were completely reimbursed a month later. Save your receipts, keep a copy of any emails or documentation you receive related to the cause of your delay, and don’t be shy about filing a claim for your expenses. 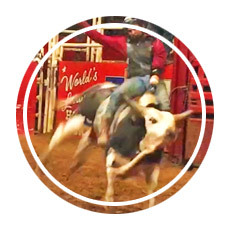 The representatives we worked with at World Nomads were compassionate and knowledgeable about the specific plan we purchased, and we appreciated the guidance they provided to help us understand the options we had available to us. We ended up getting more money back than we spent on the policy in total, so it was well worth the expense! Our trip to Argentina, Uruguay, and Antarctica was perfect, and the journey home was anything but. We learned a lot from our escape from Fin Del Mundo, and the friendships we made along the way are worth the delays and frustrations we encountered. Sometimes, truly terrible experiences are the ones that build our resilience and make us better travelers, colleagues, and people. It will be a while before we crave empanadas, though… or before our travels take us back to the Fin Del Mundo and the end of the world. Do you love a good travel horror story? We have a few more from our adventures!